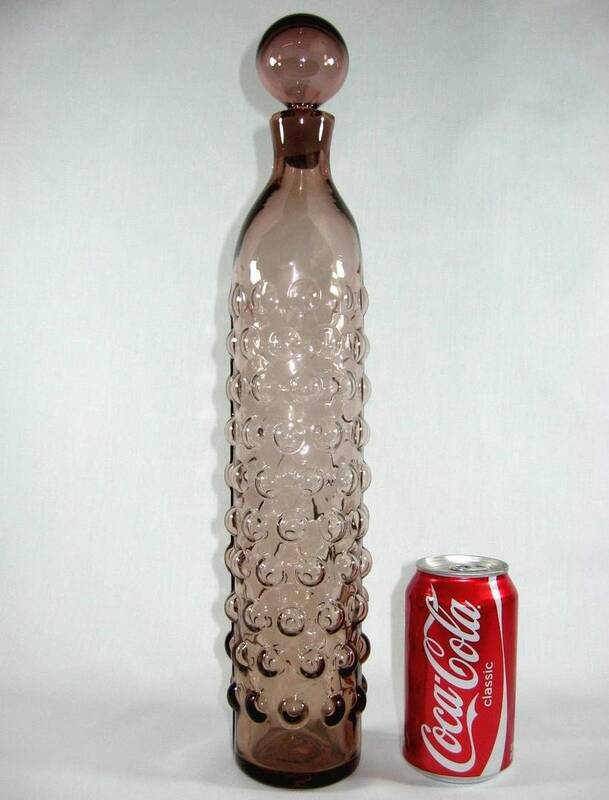 BLENKO Wayne Husted #6037 Vineyard | Bubble Wrap Glass Decanter in Rare LILAC!? You're looking at a ridiculously gorgeous Blenko #6037 decanter by Wayne Husted as part of his Vineyard Series. It was first designed for the 1960 Blenko catalog and was produced for 3 years through 1962. Our decanter has the Blenko acid-etched mark on the base, putting its production in either 1960 or the first half of 1961. 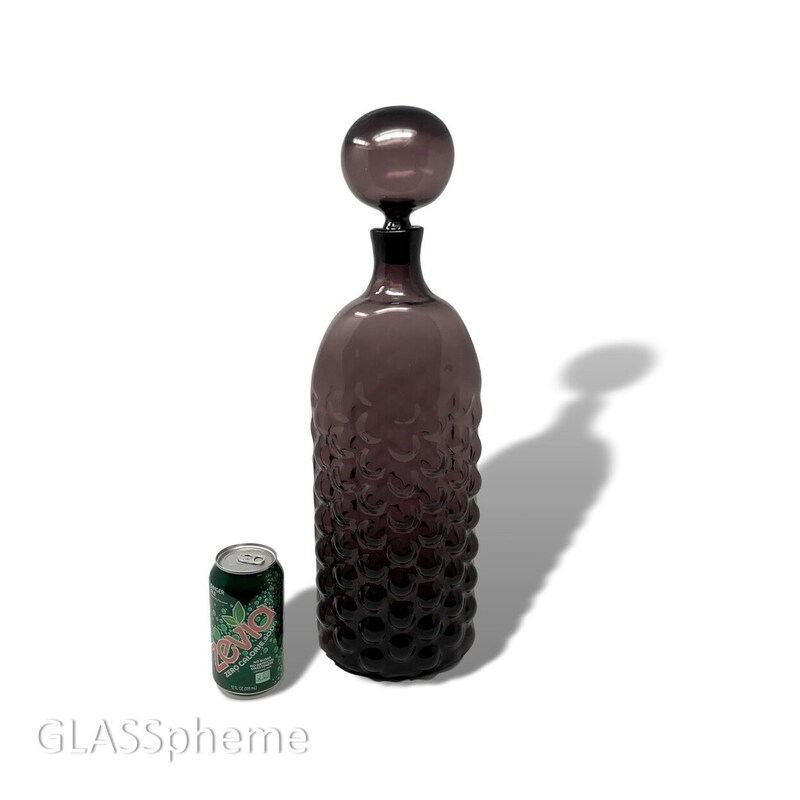 The distinction is important because LILAC was the purple of 1960 and AMETHYST came on in 1961, and I'm as sure as one can be that this decanter is LILAC--a rare gorgeous purple made in 1959 and 1960 only. Purples are quite tricky to capture well (or at least consistently) in photographs depending on the lighting, but this beauty, displayed with my Blenko Lilacs and Plums, has more blue tones in it than red, making it much more PURPLE than your average amethyst. Photo #4 shows this piece next to a plum and a lilac, taken with a flash. 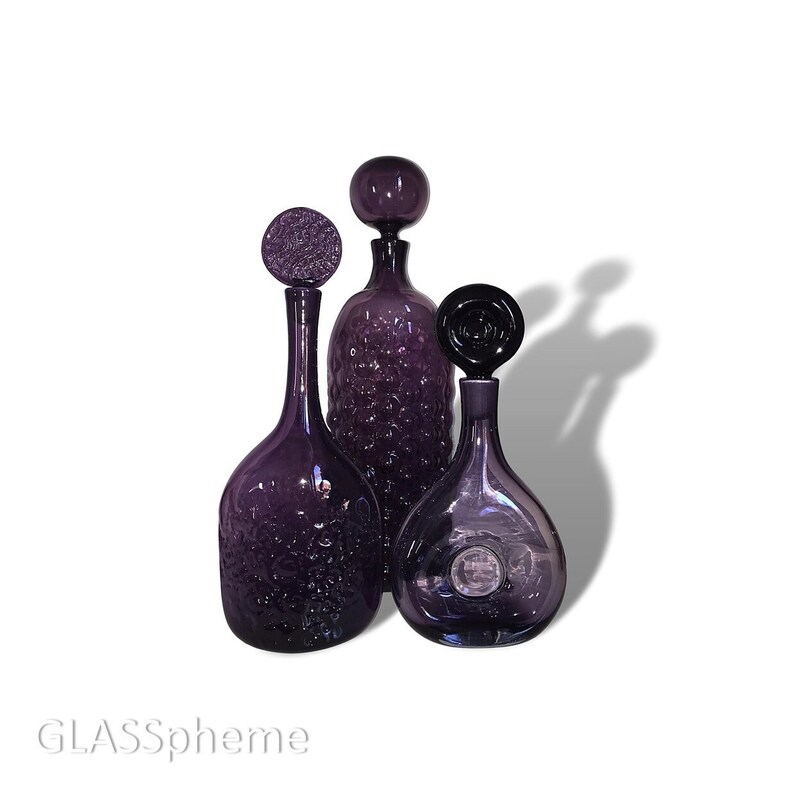 But Lilac decanters always feature a light purple base and a dark purple stopper right? Typically, yes! 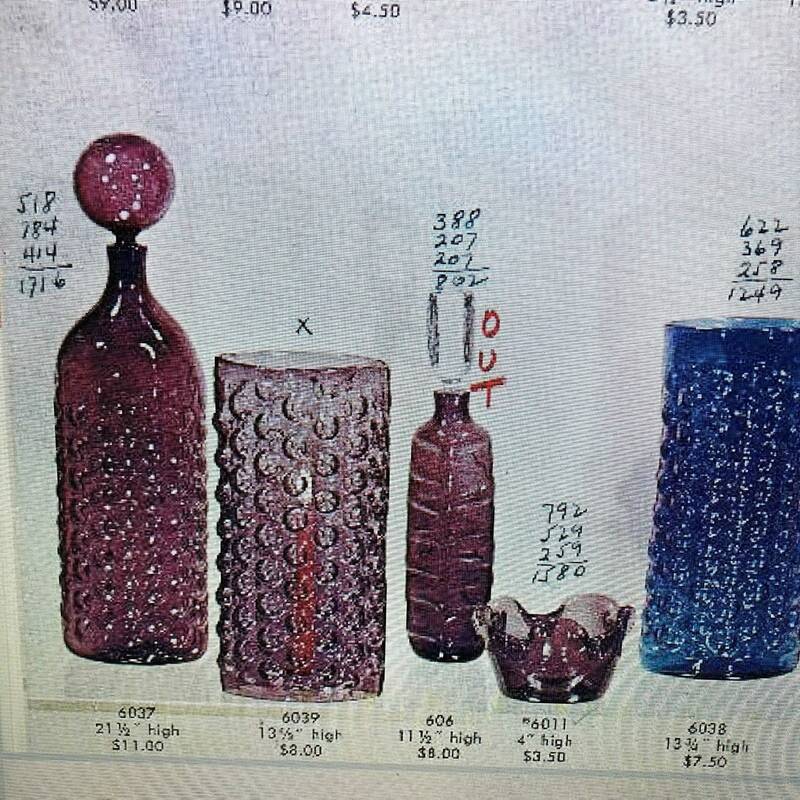 BUT check out the screenshot from the 1960 catalog, which featured the #6037 decanter in LILAC (see photo #6)... 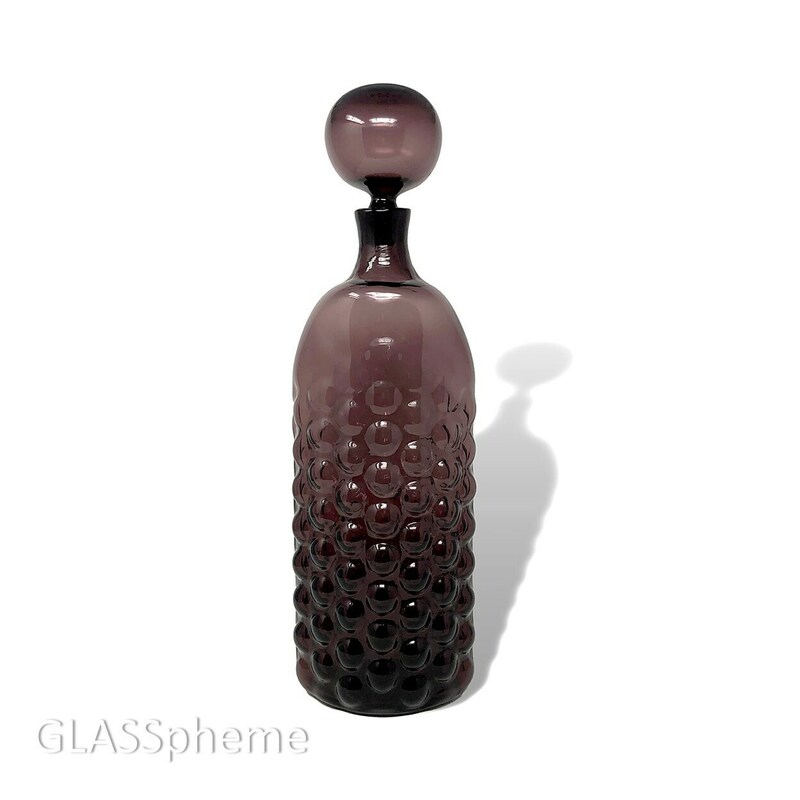 Both the stopper and decanter are in the same rich deep purple! The last photo shows a 1961 (amethyst only) variation on the Vineyard (or Bubble Wrap) decanter. No doubt THAT'S amethyst. 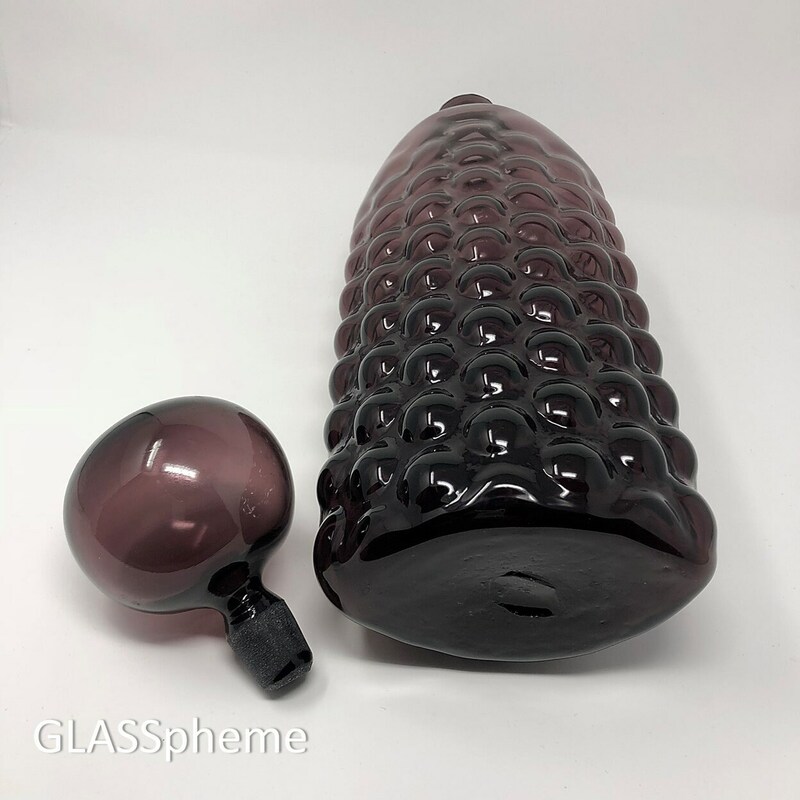 Finding this decanter in ANY purple is a rare treat--searching Worthpoint for Blenko 6037, Blenko Vineyard Decanter, Blenko Bubble Wrap Decanter, and Blenko 6040 (the smaller sized Vineyard decanter) ALL failed to turn up any purples... But the deep dark purply purple of this beauty has me convinced its a Lilac and not an amethyst!